It's important that you work with your baby's healthcare provider to prevent and treat asthma attacks. With the right medications, education, an asthma action plan, and regular medical follow-up, most asthmatic children do just fine. Luckily, many babies who are asthma sufferers tend to get cured as they grow up. This is more likely if the child receives good care and treatment. Many researchers have also come to the conclusion that most children develop immunity to the allergens that caused an episode of asthma in their early years. A number of factors are responsible for greater probability of an asthmatic episode in infancy; immunity to these seems to develop as the child matures. Exposure to allergens such as dust mites, cockroaches, mold, pollens, or animal dander can trigger or worsen symptoms in some children with asthma. This is referred to as allergic asthma. Seasonal allergies to outdoor pollens (also called hay fever) won't usually be a problem until your child is 4 or 5, because it can take that long for him to be exposed to enough pollens to develop a sensitivity to them. Allergies to dust mites, mold, or animal dander may develop earlier in life, though. About 75 to 80 percent of children with asthma also have significant allergies. If your child has asthma and you suspect that he has allergies, you may want to take him to an allergist for further evaluation and treatment that may help prevent asthma attacks. How can I tell whether my baby has asthma? You'll need your doctor's help. Asthma can be difficult to diagnose in children younger than 2, because conditions other than asthma can cause wheezing or wheezing-like sounds. In fact, viral respiratory infections are probably the most common cause of wheezing in babies. However, if your baby coughs frequently and has allergies or eczema, and your family has a history of asthma and allergies or eczema (especially if you and your partner both have them), there's a good chance that your baby has asthma. His symptoms are likely to be worse at night. Your child's doctor will examine your baby and take a careful history, including a family health history, to help make a diagnosis. Asthma in babies are more widespread then most of us think. Children suffer more than adults because they are unable to explain what is happening. 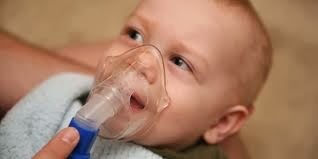 educating about asthma and simple precautions, you will be able to control much of the suffering caused by baby asthma. Limit his exposure to dust mites: Encase your baby's mattress in an impermeable cover, remove carpeting and plush toys from his room, use blinds instead of heavy fabric drapes, and wash his bedding once a week in hot water. Keep your baby away from secondhand smoke. Cigarette smoke isn't technically considered an allergen, but it does irritate the lungs. Limit his exposure to air pollution. Air pollutants such as ozone can irritate the lungs and cause breathing problems in people with sensitive respiratory tracts. Check your local newspaper or radio for reports on the Air Quality Index, and consider keeping your baby indoors on days when the air quality is poor. If your child has developed an allergy to your family pet, keep the pet outside if you possibly can. Of course, depending on your pet's disposition and your living situation, this won't always be possible.